Good Morning! Thank you so much for stopping by. The sketch is up at Tuesday Morning Sketches and I really enjoyed playing with this one. Well, I love them all, but this one was really fun. 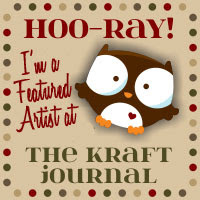 Our sponsor this week is DRS Designs and I am featuring a couple of their stamps. Peeps happens to be one of my favorite things... not to eat, they're just adorable! So I am using their Simple Easter Bunny stamp. I colored them up with only one Copic color (each) and then covered them in Glossy Accents. While that was still wet I sprinkled quite liberally with Martha Stewart coarse glitter to sugar these little bunnies. I really didn't need to take this second picture - the first one shows their glitter really well! But hey, you can never get enough of sparkle! My card features some of the last of Country Drive paper by Echo Park that I have. 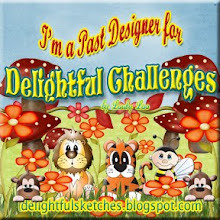 The greeting is also DRS Designs that I cute apart. The layering card stock is actually Elegant Eggplant - but it looks black in these pictures... I've never gotten this color to photograph well. 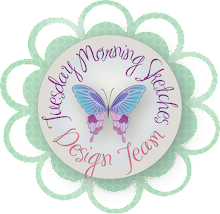 Thank you so much for your visit - please join us at Tuesday Morning Sketches and while you're there, please go out to each of the DT members blogs to leave them a little love. Have a great day! Hello! Happy Sunday evening. So I decided between loads of laundry and cleaning out the front garden of old mulch and molding leaves, I'd play along with some challenges. I made a Clean and Simple card to send to my friend Ana. Here's what a I created... yes my card is white, not cream like it looks in the photo. It's night time and I don't have the best lighting. But still - the card looks great. And Ana won't judge it harshly. I think it's bright and cheery and it says all I need to say to a friend. That's what a card is supposed to do, right? My card features stamps from the Bloom stamp set by There She Goes Stamps (no longer in business). The paper is from the Citrus matstack by DCWV. A small strip of washi tape that I got for free from someplace I saw on Facebook. The dots are from Itty Bittys (SU!) stamped with Memento Dandelion, Cantaloupe and Tangerine inks. Thank you for stopping by and allowing me to play along with your challenges. Have a great evening and I hope you're week is a good one. Good Morning! Thank you for stopping by. The newest sketch is up at TMS and this one is by Debbie. She's challenging us for sure! I like this sketch - it could be great a movie night party invite. But birthdays start next week, so I've got birthdays on the brain. Our sponsor is Bugaboo and I am featuring Frame it Birthday. I did modify the original stamp a little by drawing a line in the middle of image and using only what was above that line. I just couldn't make the whole image work for my card. My card base is Gable Green (SU! ), paper from Hippie Chic (DCWV), banner die (CC Designs) and various Copics. I did add a little shimmer with Wink of Stella on the balloons, and metallic Wink of Luna (purple and green) touches. My son turns 21 next week Tuesday, I think he'll like it. Not girly - just bright and fun. 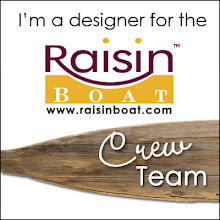 Please be sure to visit my design team and leave them some love. Thank you for stopping by and we'll see you over at TMS. Have a great day.